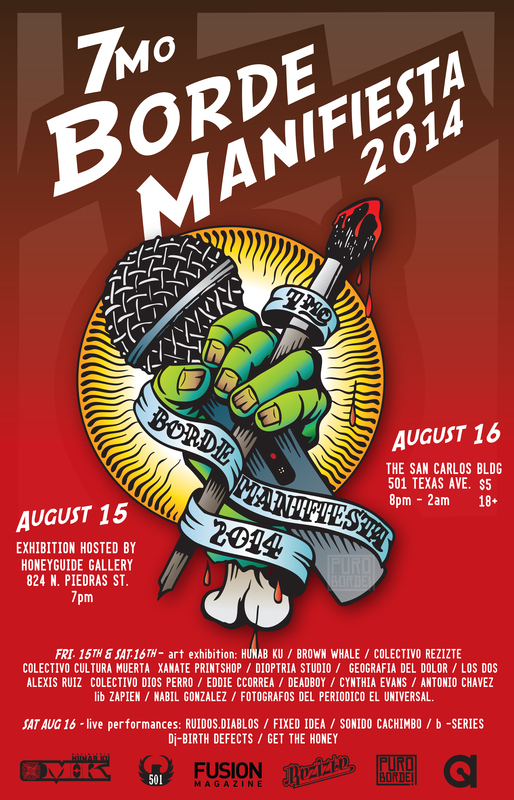 Puro Borde will be hosting its annual Borde Manifiesta this August 15th and 16th in El Paso and August 22 in Cd. Juarez. One thing that is not really being mentioned is how entrance fees and all donations collected will go to help fellow musician Manuel Alejandro Valtierra Romo, better know as “Keru” get a much needed electric wheelchair. You can read the spanish interview by Ruth Lopez gave Keru here. On August 15th they will kick it off Borde Manifiesta with an exhibition hosted by Honeyguide Gallery at 824 . N. Piedras St. The exhibition will start at 7PM and is set to host works by Hunab Ku / Brown Whale / Colectivo Rezizte / Colectivo Cultura Muerta / Xanate Printshop / Dioptría Studio / Geografía del Dolor / Los Dos / Alexis Ruiz / Colectivo Dios Perro / Eddie Correa / Deadboy / Cynthia Evans / Antonio Chávez / Lib Zapien / Nabil Gonzalez /Fotógrafos del Periódico El Universal. On August 16th the art exhibit will continue at The San Carlos Bldg. at 501 Texas Ave. from 8PM to 2AM there will be a $5 cover charge. This second night will introduce live performances by: Ruidos.Diablos / Fixed Idea / Sonido Cachimbo / B-Series / Dj – Birth Defects / Get the Honey. On August 22th the event will move into Cd Juarez and start at 8PM in The Independent Music Hall Hermanos Escobar #6665 Cd. Juárez, Chih.. Cost for this event is set at $30 M.N. This collaboration with Alianza Fronteriza will bring performances by Sonido Cachimbo / Aitanire / Keru Motocaca / Peccata Minuta /El Equilatero / Lunatic. Exposicion / Puro Borde / Hunab Ku /Colectivo Rezizte / Lib Zapien / Xanate Printshop.